For this edition of ‘Well That Didn’t Work’ we find ourselves, and probably not for the last time, delving into the vaults of WCW. The year 1999 offered us many candidates for this column, as WCW desperately tried everything and anything to turn the Monday Night War back in their favour, but today we shine the spotlight on the infamous KISS Demon character. For the benefit of our younger readers, and the older ones who have spent many years living under a rock, KISS were/are a really famous glam rock band. With their over the top face painted appearance they are perhaps more famous for their image and associated merchandise than their music. To complete the background to this story it will come as no surprise that head of WCW at the time, Eric Bischoff, was a massive KISS fan. Like with the motorbike inspired PPV Road/Hog Wild, Bischoff deviated from his business mind to indulge in one his childhood fantasies. He struck a potentially lucrative deal with Gene Simmons and the rest of KISS to promote a wrestler that personified the band. Also included in the deal was the guarantee of a PPV main event match featuring The Demon character and a live performance on Nitro by the band during which the character would be introduced. 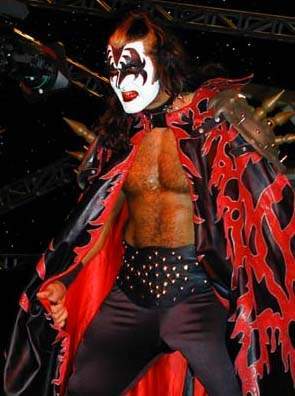 According to Dale Torborg, the wrestler who portrayed The Demon character, the plan was to establish an entire stable of KISS inspired wrestlers, one for each original member of the band. On paper this doesn’t sound like too bad of an idea. Like them or not KISS were/are a massive band with a huge fan base to tap into. Also, the character itself was kind of cool looking. I’ve always thought that Gene Simmons (the member of the band which The Demon was based on) looked more like a scary wrestler than the bass player for a rock band. So where did it all go wrong? The whole concept was flawed from the outset. Bischoff pursued and struck the deal, the problem was that he was so desperate to make his dream come true that the deal he struck with KISS was only lucrative for the band. Simmons and the band maintained all imaging and merchandising rights, all WCW gained was an extra body to slot into an already bloated roster. Even if The Demon character had taken off and caught the audience’s attention WCW would have missed out on the gold mine that is merchandise sales. Such was the desperation for ratings during the Monday Night Wars that Bischoff completely ignored this potential saving grace, should the character bomb. So if the mission was to increase ratings then how did KISS and The Demon character fair? Not too well as it turned out. For some reason the decision was made to debut The Demon at the end of the August 23rd episode of Nitro. What’s wrong with that I hear you ask? I mean debuting at the end of the show is clearly a statement of intent, that’s the main event slot. The problem was that the character debuted during a musical performance by KISS and not during a match. Incidentally this performance cost WCW a reported $500,000, and the band only played one song. Even worse is that it was billed purely as a musical performance, viewers were fully informed that there would be no more wrestling on the broadcast. So what happened next? The millions of wrestling fans that were watching the wrestling show changed the channel, resulting in one of the lowest rated segments in the history of Nitro. Had they placed the performance in the middle of the show viewers may have tolerated it, or at least resumed watching after channel hopping for a few minutes. I guess this just confirmed that although KISS had/have millions of fans not very many of them are interested in professional wrestling. So the deal that was struck pretty much relied on The Demon being a success, but his debut was a complete failure. Therefore you would have thought that WCW would have pulled out all the stops to recover the situation, right? Wrong. The flop that was the August 23rd Nitro proved to be the final straw as far as Bischoff was concerned and he was relieved of his duties shortly afterwards. Determined to undermine Bischoff and make him look as bad as possible, the new management in WCW set about destroying his creations. With The Demon, WCW were contractually obligated to feature him; however nothing was said about him winning or losing. He lost his debut match against the ancient Terry Funk, which tells you all you need to know about how he was booked during his time in the company. As WCW were obligated to feature The Demon they threw him into a stable with Vampiro and The Insane Clown Posse, who also wore makeup and acted a little weird. This essentially just gave him something to do and a reason to appear on TV. Oh, and what about that PPV main event match? Well WCW presented a “Special Main Event” bout at Superbrawl 2000 where he wrestled The Wall, which of course he lost. The match was given this handle purely to fulfil that aspect of the contract. In no way was it a main event, for starters it was only the fourth match on the card. As if we needed any more reasons to explain the failure of The KISS Demon character it also suffered from something few gimmicks have ever recovered from – it was portrayed by two separate individuals. During The Demon’s early, non-wrestling appearances, such as his debut during the KISS performance on Nitro, the character was played by Brian ‘Crush’ Adams. However, by the time he made his in-ring debut The Demon gimmick had been handed to the aforementioned Dale Torborg. Apparently Adams thought the gimmick sucked and wanted shot of it, which was a wise decision. However, despite the gimmick being horrendous it did eventually find its way to the right man. Just like Eric Bischoff, Torborg is a life-long KISS fan. This was also his one and only run in a major wrestling promotion. So I guess it’s kind of cool that, if nothing else, the guy that portrayed this awful gimmick at least enjoyed it and it gave him the opportunity to live out some of his childhood dreams. This entry was posted in WCW, Well That Didn't Work and tagged Brian Crush Adams Demon, Dale Torborg Demon, Eric Bischoff KISS Demon, Gene Simmons wrestler, KISS Demon, KISS WCW, The Demon WCW. Bookmark the permalink. Just saw Dale Torborg Tuesday night on the Yankees @ White Sox broadcast on YES Network as conditioning coordinator for the White Sox.